US Daily Review of "Dealing with Meetings You Can't Stand"
If you want to make everyone on your team at work feel like you’ve gotten absolutely nowhere, just hold a meeting. Meetings have a knack for bringing out the worst in us, from disengagement to irritation to that post-mortem eyeroll at the watercooler. Yet we can’t stop having them — and shouldn’t we have them? 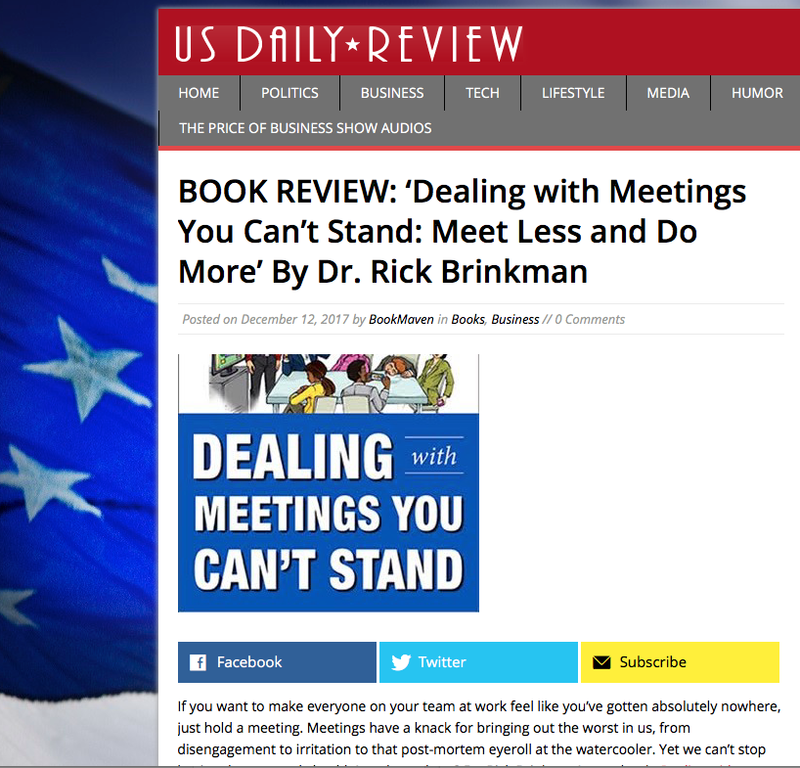 Dr. Rick Brinkman’s new book, Dealing with Meetings You Can’t Stand: Meet Less and Do More proves there’s a far better and more productive way to hold meetings, and it lays out a proven approach in a highly entertaining style. Back up a moment, because rather than spoil the fun — and it is a fun read, and very refreshingly so — let’s just talk about the why we have to have meetings in the first place. The reality is, we don’t, according to Brinkman. Most of us don’t ask if we should even be having a meeting, since we’ve come to believe that meetings are a part of the day like rain is a part of weather. But Brinkman insists we do ask why. we’re calling that meeting. If it’s to present information, he asserts, don’t do it. Meetings are not the time to present the new 25 page instruction manual or corporate identity report. They’re the time to talk about it. And there are just way too many pointless meetings being held, he says. There’s a key difference between information and interaction, in other words. If you’re holding the meeting to get everyone discussing and strategizing about that document, terrific. First, send the materials out well ahead of time, and make it clear you expect it to be reviewed and understood before people walk in the door. This may well ring a bell with some readers, and it should: Brinkman is a master at illuminating just why common sense should prevail and doesn’t when it comes to gathering us all together. He also explains the immense importance of a well-thought-out agenda, which should include every single item to be covered, realistic time allotments for each one, the purpose of discussing them, and also what is expected of the people talking about them. The bottom line is control: of time, of discussion, and mostly, of people. If you want to control the meeting, you have to frame it clearly, set expectations, and have tools in place to help rein in the variables, such as that “what exactly are we talking about here” confusion that makes everyone shift a little farther back in their seats. Brinkman provides savvy and subtle ways to control those disruptive personalities that tend to hijack the goings-on. We’ve all been there to listen to the ramblings of a Know It All or a Think They Know It All — as the author labels them. We’ve all heaved a sigh when someone starts seizing control of the discussion because they don’t have faith in the ability of the facilitator — a bullying personality type Brinkman calls a Tank. Those naysaying headshakers who frown endlessly at every single idea? They’re judges, notes Brinkman. As guidebooks go, this is a good one to set prominently in your office and refer to frequently. It’s meant to provide you with better techniques that you can improve on with time. The more you craft a workable agenda, the better you’ll get at it, for instance. And the more people see you able to defuse the disruptions, the less disruptive they become. Master the tools in this book and use them to run your next meeting, and you’ll feel a remarkable transformation take place: people may actually ask you when the next meeting is. But if you’re not the one in charge, don’t despair. Brinkman provides a script for making tactful yet convincing suggestions for trying a better method. In this book, he’s thought of everything.